The campfire is an integral part of the 4 Deserts Ultramarathon Series and RacingThePlanet Ultramarathon. 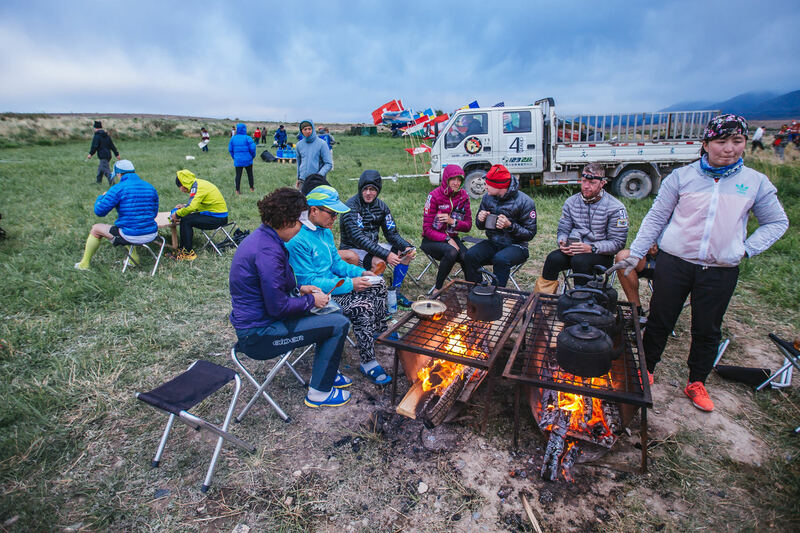 Nurtured and tended by our local staff, who keep a constant kettle of water boiling, the fire could be counted as the greatest luxury at a 4 Deserts / RacingThePlanet race. After a hard day in the desert, there is nothing quite like the camaraderie and comfort provided by the fire. An opportunity to meet fellow competitors, swap tips and marvel at some of the ingenious meals being prepared, goes a long way to help ease sore limbs. 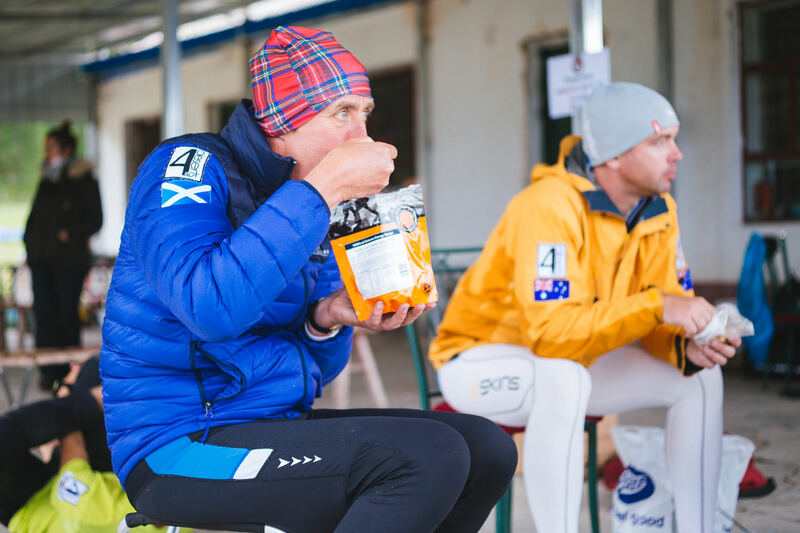 Before competitors awake in the morning, the fire is rekindled and the kettle of water boiled for breakfast - a blissful cup of tea or coffee and a bowl of Expedition Foods Porridge with Strawberries are perennial favourites to savour as the sun rises. Handmade flags and banners are used in all RacingThePlanet / 4 Deserts races, including the Gobi March. Sometimes the locals help with displaying the banners. At the Gobi March 2006, expert Kazak horsemen carried the flags to start the event. In addition, nationality flags line the start and finish line each day typically representing 40 or more nationalities. 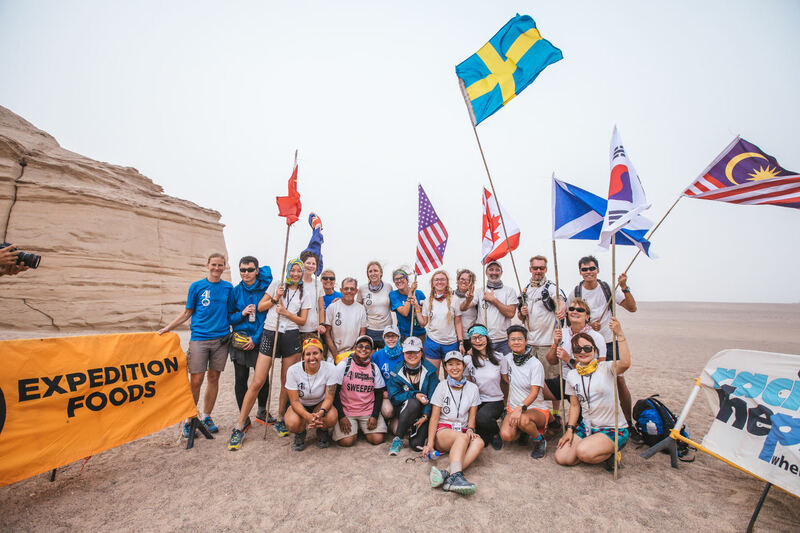 To date, more than 100 nationalities have taken part in a 4 Deserts or RacingThePlanet race. Volunteers are carefully selected from around the world to ensure a variety of nationalities, language abilities, fitness levels and general experiences to form a world class support team able to work successfully in challenging conditions. Approximately three volunteer applications are received for every available position. 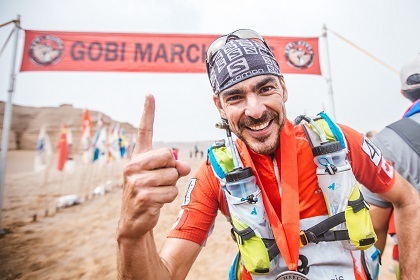 View our Gobi March staff and volunteer team. There is a fast growing global community interested in RacingThePlanet / 4 Deserts races - not only friends, family, supporters and former competitors, but also a wide range of media as well as a fanbase of people inspired by the dream of one day competing. To keep up with the demands of this expanding community, we are constantly developing our media capabilities. RacingThePlanet / 4 Deserts uses a combination of satellite, mobile communications and drones to distribute content from the races to our website and to broadcasters around the world. During each stage of the race we post updates to the website about race leaders and individual competitors several times per day. We also post daily video highlights captured by staff, volunteers and competitors. At least 150 photographs are uploaded daily from the race capturing the locations, highlights and spirit of the event. We also distribute daily features about competitors and the locations as well as stage updates on the race website. 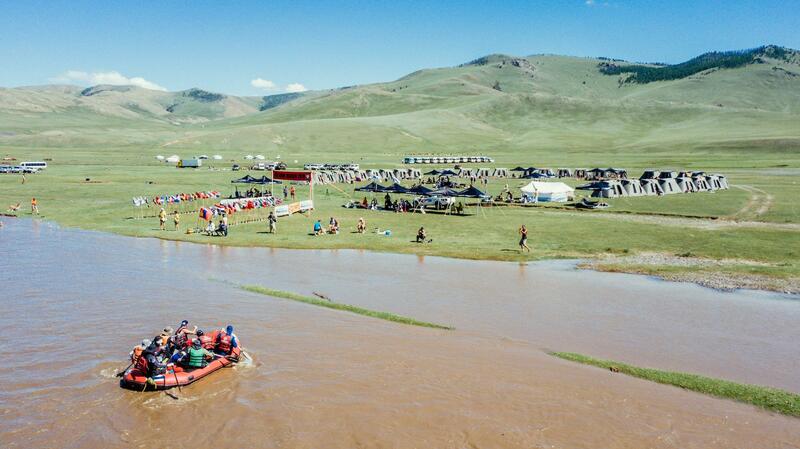 Overall positions and timings are logged on the website as soon as possible after the last competitor crosses the finish line of each stage and competitors' blogs and emails are posted and sent out each evening. RacingThePlanet / 4 Deserts communications systems feature top-of-the-line, lightweight tablets. 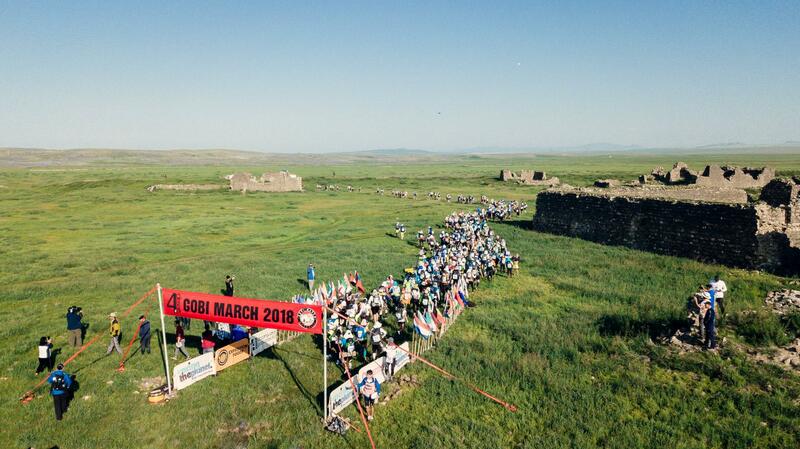 The Gobi March features twenty of the most powerful portable transceivers (or handheld radios) available, twelve 25W mobile transceivers (car radios) and two repeater stations. In addition, staff will utilize Iridium satellite phones as backup – the only satellite provider with global coverage from Pole to Pole. In some areas of the course, standard cell phones will be utilized. To obtain broadband internet coverage, RacingThePlanet / 4 Deserts will use BGAN satellite terminals which have been successfully deployed in all the major deserts of the world including Antarctica. RacingThePlanet / 4 Deserts is bringing 3,500 glowsticks to mark the Gobi March course in the evening hours. 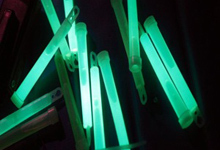 These glowsticks are purchased directly from the factory to ensure that they offer maximum light while in the hot and cold climate of the desert. In addition, special highly reflective tape is attached to each pink marker as back up in case the glowsticks fail or are taken by children along the course. RacingThePlanet / 4 Deserts endeavours to give back to the local community. In 2013, RacingThePlanet and the Esquel Y.L. Yang Education Foundation launched a seven-year scholarship program, called the Esquel-RacingThePlanet Scholarship Program, which supports education for local girls in the Xinjiang Province. RacingThePlanet / 4 Deserts has collaborated with the foundation since 2005 by donating sporting equipment, computer centers and more than 8,200 books to schools along its race routes. It has also sponsored Operation Smile missions around the world. RacingThePlanet and the 4 Deserts will never waiver in its efforts to support charities and worthwhile initiatives around the world. The finish line of Stage 6 is a time for celebration for all race participants to enjoy the past week of hard work. Finishing competitors receive their finisher medals and everyone partakes in food and drink. There is local music and sometimes dancers providing entertainment. The finish line takes an enormous amount of thought and planning, but sometimes plans need to be changed. In the past, we've had to purchase wheat fields and hire elderly men as the cheering squad. Oftentimes, we've had children from local schools attend the finish line to cheer on those reaching the finale of 250 kilometers. 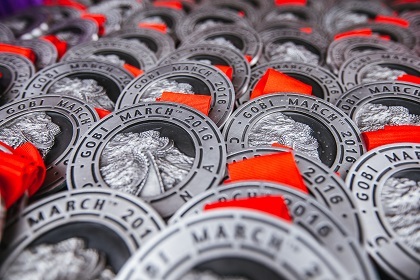 Competitors that finish the Gobi March receive specially designed pewter medals presented at the Stage 6 finish line. Each medal is made of the highest quality pewter from Malaysia and weighs 345 grams. The medals have become an iconic feature of the 4 Deserts. 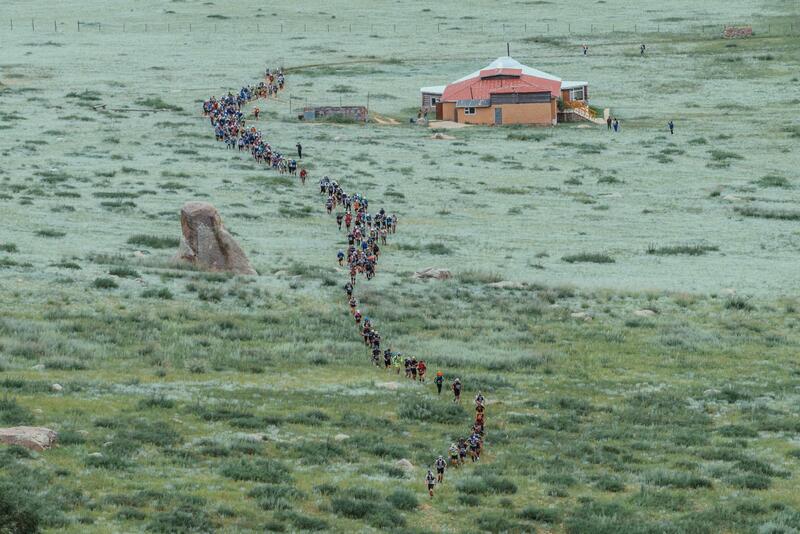 Expedition Foods is the official food partner for the Gobi March. Expedition Foods pioneered the concept of expedition foods by providing highly nutritious, delicious and lightweight food, and has built a reputation on quality, service and choice, boasting arguably the largest range of meals available in the world. Expedition Foods’ 800kcal range is the highest calorie-to-weight food available on the market. They also have a regular serving range of 450kcal meals and an extreme energy range of 1000kcal. Expedition Foods’ objective is to provide a mix of traditional meals with dishes from around the globe. The diverse menu, which appeals to all tastes, is coupled with continual innovation and product development. Expedition Foods can be found at www.expeditionfoods.com. 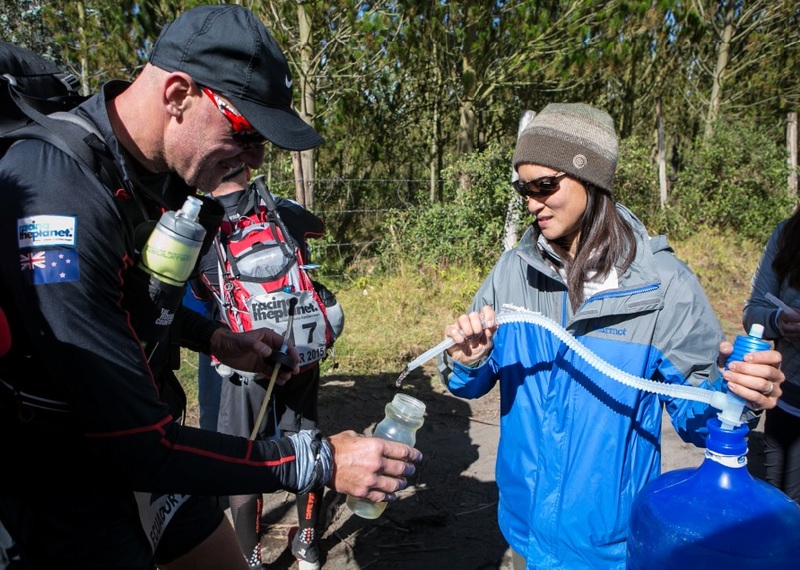 In 2015, RacingThePlanet / 4 Deserts introduced 25L re-useable bottles of water to reduce trash and lessen the environmental impact. By using this new water system, we have reduced the amount of rubbish generated from plastic bottles by 70%. This is part of the RacingThePlanet / 4 Deserts Race Series values to leave no trace. 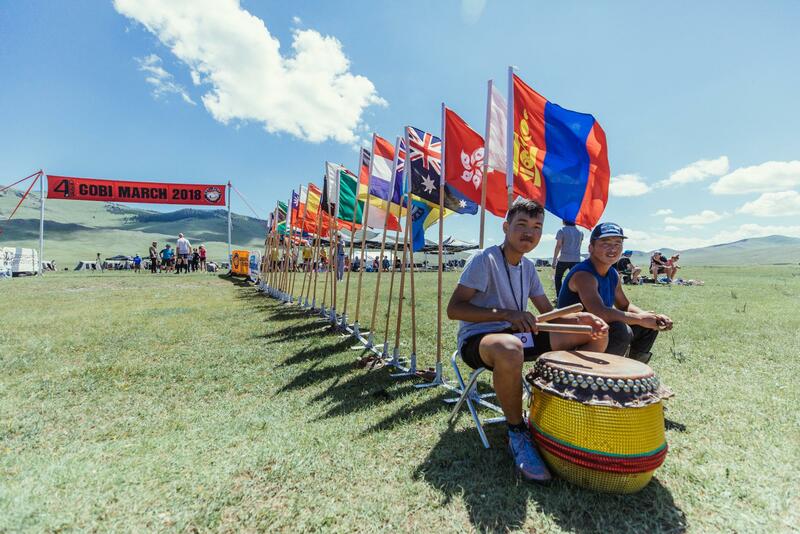 During the Gobi March more than 15,000 liters of water will be consumed by participants as they complete the course and prepare their meals at the Camp each night.